For the purposes of Pie V. Cake, we’ll consider kombucha (fermented tea with live bacteria and yeast, like yogurt) a dessert, since it requires sugar in the brewing process. 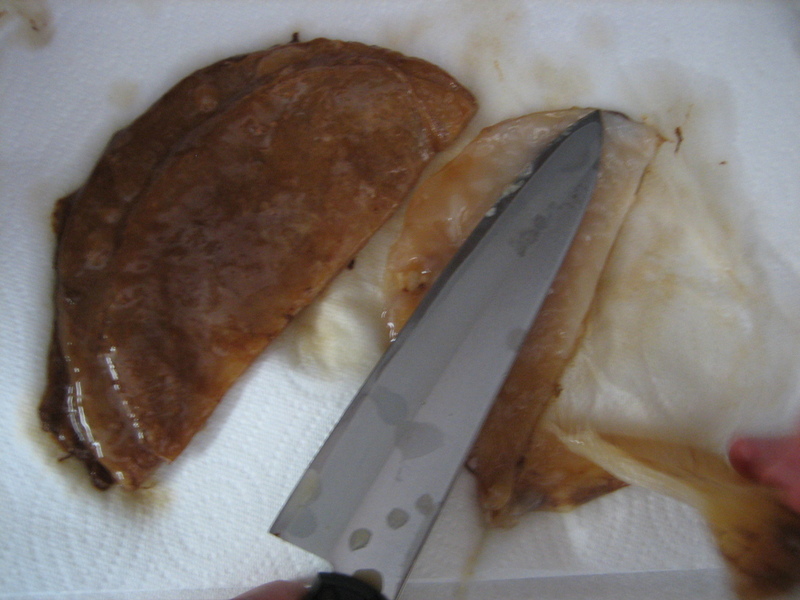 Kombucha supposedly originated in China or Russia, but no Chinese person I know–and I know a lot of them–has heard of it. Let's begin with a shot of the finished product. This was the blueberry ginger flavor. It’s not hard to see why they might want to disclaim it. Kombucha is not for the faint of heart. 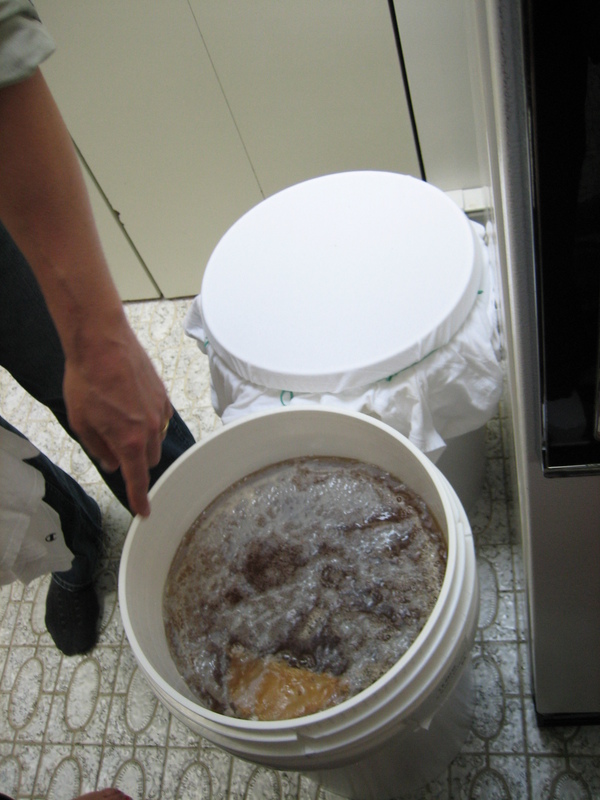 It smells like vinegary feet, but tastes like a nonalcoholic cider or beer, depending on your how your brew turns out. Sometimes there are trace amounts of alcohol, like in the G.T.’s brand that was recently pulled from Whole Foods’ shelves. No wonder I was unwittingly getting wasted during my lunch hours! Did I mention that there are usually unidentified slimy, floaty bits in every bottle? They’re babies from the “mother” fungus, a disturbing name for the mushroom that makes the fermentation magic happen, turning sugar, water, and tea into bona fide kombucha. We began by cutting the mother in half. Mr. X-sXe went a bit bonkers and decided to brew 12 gallons in one go. He even invested in a huge gas burner, pots, and some fancy gadgetry. I feared he would burn down the house in the name of kombucha, which is just as tragic as burning it down in the name of fried turkey, if not more. Make sure all of your bottling gear has been sanitized. 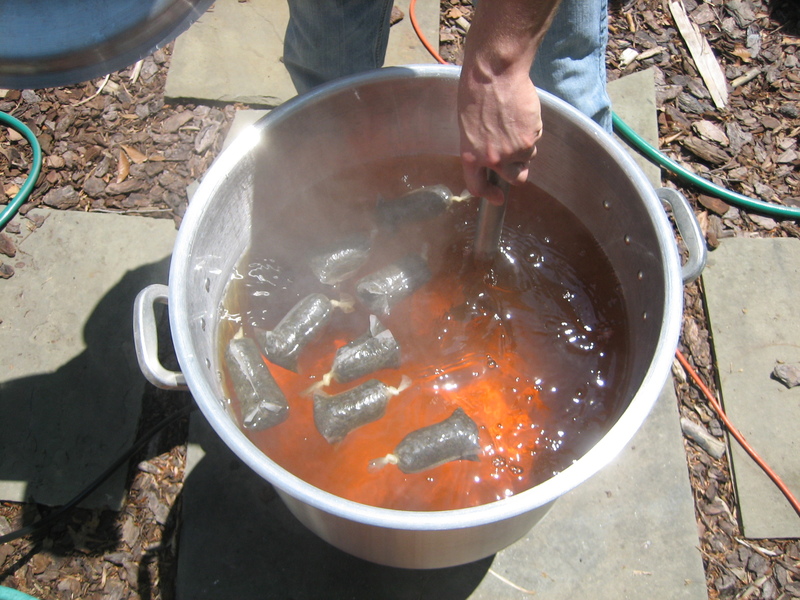 There have been instances of people poisoning themselves from contaminated kombucha, so we don’t recommend doing a huge batch like this if you’re a brewing newbie. We purchased a mother fungus from Kombucha Brooklyn over a year ago–the one we used was a remote descendant of the original. 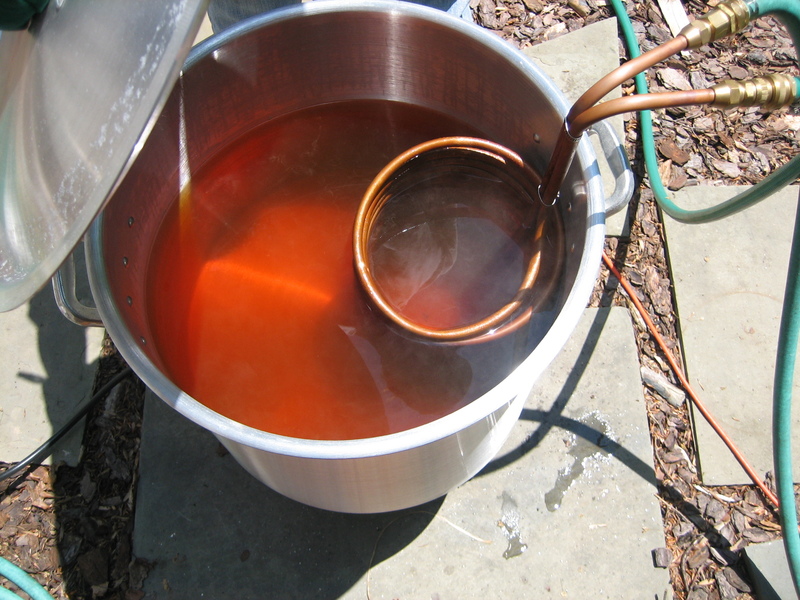 We emptied 12 gallons of distilled water into the pot, adding 1 cup of sugar per gallon. If you want it sweeter, you can add more. (1 cup per gallon made a pleasantly dry kombucha.) The amount of tea you use is up to you. We stuffed 8 large teabags into ours, the kind you use for looseleaf tea. Those floaters are actually teabags stuffed with oolong leaves. After letting the pot boil, we cooled it down with this wort chiller, which took it from boiling to cold in just a few minutes. See what I mean about the gadgetry? The wort chiller. Guys dig it. The brew then goes into these plastic vats to sit for 2 weeks, while the mother goes to work. We covered the vats with an old, clean t-shirt, secured by a massive rubber band knotted together from many small ones. Over the course of the fortnight, a vinegary perfume took over that area of the kitchen, followed by some throw-up-in-your-mouth-a-little moments as we would let guests peek beneath the t-shirt to see what was going on. The 2 halves, which started out the size of our hands, grew over those 2 weeks to entirely cover the surface of the white plastic vats. The sight of the mother may cause dry-heaving among your friends. After the 2 weeks were up, we bottled the brew, adding 1 teaspoon of sugar and a few turkey basters’ worth of fruit juice (lemon, lime, ginger, acai, etc.) to each bottle, and bottling some without any additions. 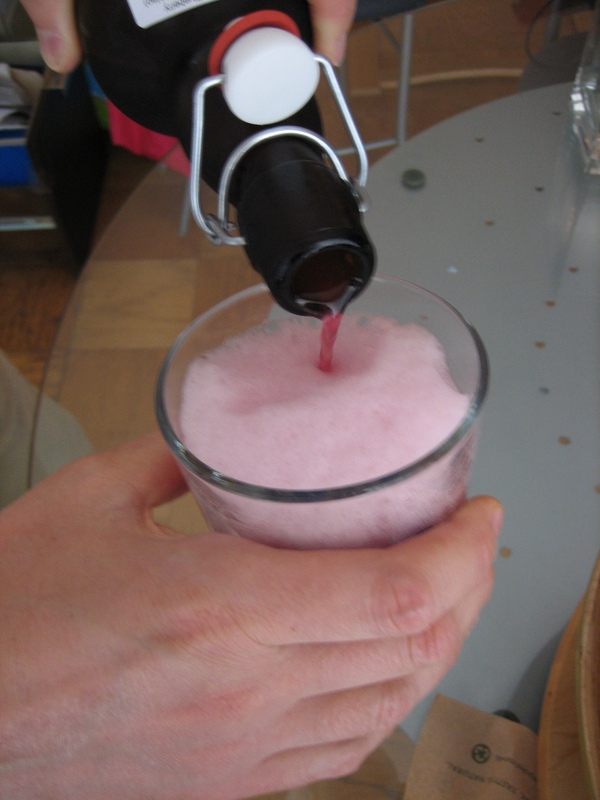 The bottles sat at room temperature for another 2 weeks to allow for more carbonation. Finally, 4 weeks later, they were ready to drink. 12 gallons made 80+ beer bottles’ worth. Don’t forget to mind the space in the fridge. Ours currently has none for real food.